Most people are familiar with traveling with duffel bags and suitcases to pack and carry all their items. You may think even waterproof duffle bags would be best for travel, but a garment bag can add another layer of protection to your clothes and help keep them wrinkle free, if you are traveling with business or special occasion clothing. If you’ve tried to pack your perfectly ironed clothing into a duffle bag or suitcase, you know how frustrating it can be to keep them crease free. A garment bag can help you bring along your clothes, while keeping them ready to wear the second you reach your destination. The best travel garment bags will keep your clothes protected, while ensuring the least amount of creasing and folding occurs during your travel. We have made a guide to help you determine which top rated travel garment bag would best “suit” your needs. With our guide you can determine which brand and model will keep you happy and wrinkle free. This design by Zegur will make your travel fun and stress free. 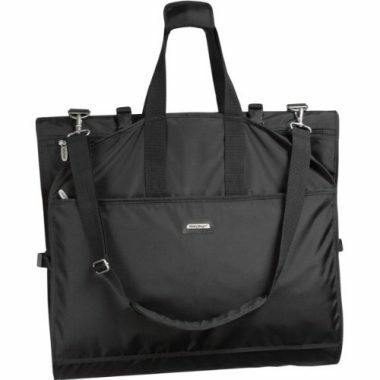 The Carry On Garment Bag will keep you organized and eliminate the hassle of packing. 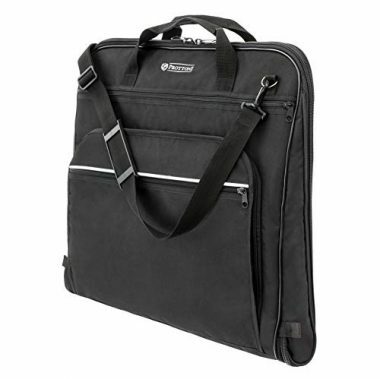 This garment bag has multiple interior zipper pockets and it can easily hold suits, dresses, shoes, and ties. It will keep your clothing clean and unwrinkled, so you can spend less time ironing and more time relaxing. It is made of a fray-resistant material and has a waterproof exterior that guarantees a high quality and long-lasting design. ZEGUR also includes their 100% Money Back Guarantee. This garment bag for suits can hold up to three suits at a time, as well as dresses, belts, shoes, ties, and toiletries. It has multiple mesh zipper pockets for added storage space. There is a deluxe organizer in the front pockets to store pens, notepads, earbuds, and other small travel items. There is also an attachable and detachable shoulder strap to make carrying and lifting easier. It is backed by Amazon Basics Limited One-Year Warranty. This is a suit travel bag that is made of high quality 100% polyester oxford fabric. It is washable, lightweight, breathable, and durable enough for a lifetime of use. It has a strong zipper that opens and closes the bag from the top to the bottom. It is a long size to fit most of your clothing like dresses, suits, and coats. It will keep your clothes fresh, clean, wrinkle, and insect free. 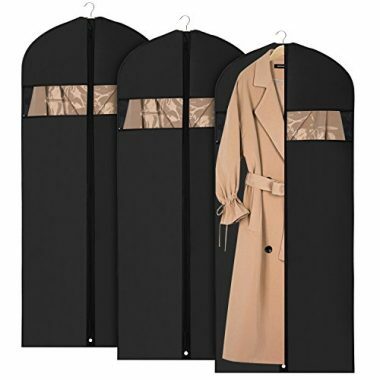 For the best value, this garment bag comes in a set of three. 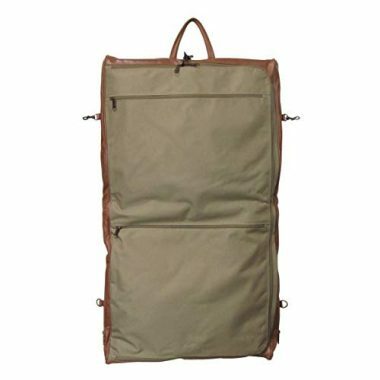 Garment bags reviews call this design by Modoker “well built” and “worth EVERY penny”. 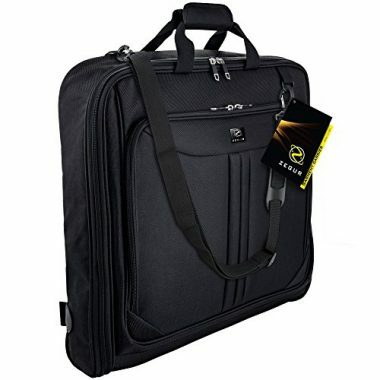 This top rated travel garment bag has a two bag in one design. It has a duffle bag that is great for use as a weekender bag and can be converted into a hanging garment bag to ensure there are no wrinkles. It is a carry on size with a 45 liter capacity. This garment bag is also water resistant and made of polyester fiber and jacquard. It is also scratch-resistant, anti-tear, and anti water splashing. 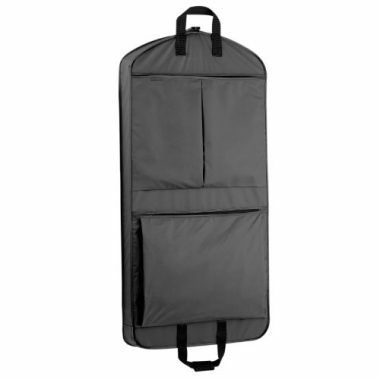 This garment bag allows you to use your own hangers and can hold up to 6 garments. It easily secures any hanger at the top of the bag, so you can keep your clothes neat and wrinkle-free. It can be taken as a carry on and placed in the plane’s overhead bin. It is made of material that is flexible and can be packed into a suitcase if desired. The fabric has a superior and high quality construction that delivers a lasting performance. This suit bag can fit up to 3 full suits, while keeping everything else organized. It has zippered pockets on the interior for accessories and smaller clothing items. It also has multiple outside pockets. It has interior hooks for organization and ensures you won’t have to iron your clothes upon arrival at your destination. You can take it on a plane, cruise ship, or anywhere you travel. It has waterproofing and triple sewn handles. This design allows you to use your own hangers and can fit up to 8 garments. It keeps your clothing neat and wrinkle-free for car, plain, train, or boat travel. It has extra-large pockets for shoes and accessories. It can be used as a carry on and is made of superior fabric. It has a full-length side zipper and a 3 Year Manufacturer’s Warranty. This tri-fold design easily fits into the overhead compartments of airplanes and has a hanger clamp. It can fit up to 6 garments, so you can grab your clothes and go. It has multiple exterior pockets and side release buckles. There is an adjustable shoulder strap to make carrying comfortable and easy. A full-length zipper gives you easy access. This garment bag for suits is made of top grain, genuine leather. It has a book-opening design and heavy duty copper-tone hardware. There is an exterior compartment with zippers and one large outside zippered pocket. For further organization, there are two size zip-up pockets. 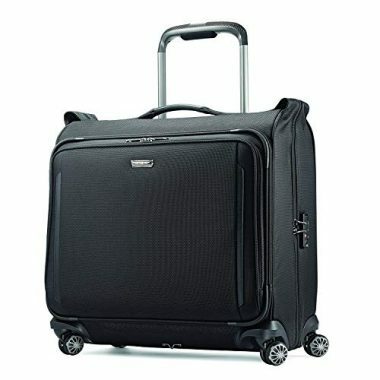 This rolling garment bag stands upright and provides easy access when open. It allows for on-hanger packing with a hanger-hook bracket. A fully featured interior has a hanger hook, extender panel, shoe compartment, compression straps, and multiple pockets. It can hold enough for a week long trip. It has a comfortable grip with a push button locking handle. When it comes to choosing a garment bag, there are many different designs that may or may not be the style you are looking for. You will have to determine how much space you need and if you are traveling by airplane decide whether you are checking on carrying on your bags. By considering important features before making a purchase, you have a better chance of finding the best garment bag that will have you traveling with ease. There are many different types of garment bags that you can choose from. Some garment bags will resemble a small briefcase, others a small suitcase, and others have just a bag that hangs on a hook. You will have to determine what type of garment bag would be best for you and the way you travel. The type of bag you choose will also be affected by how you travel and how frequently. People who travel frequently by air often will choose a rolling garment bag over a hand carried one. Many people will also choose a carry-on size versus a checked bag size to make airport check in easier and faster. The overall physical size of your garment bag will be affected by the capacity that it can hold. 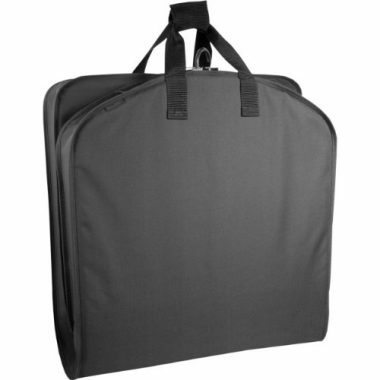 There are many different capacities of garment bags available. You can easily find garment bags that are smaller and can be carried on a plane or larger garment bag that can be a part of your checked luggage. However, the capacity of your garment bag may not be the same as a duffle bag or suitcase. You will have to think of the capacity in terms of the style of your clothing. If you are trying to pack longer clothing, like a dress, you may need a longer garment the piece of clothing the least amount of times. Other garment bags have internal organization in the form of multiple hooks to pack multiple outfits. Generally, people tend to prefer larger garment bags over a garment bag that is too small for their clothing. If you know you want to carry on your garment bag, you can look for the largest carry on size available. With checked garment bags, you are likely to have much higher limits of what is allowed on the airplane. You will find that many designs of garment bags will be either wheeled or carried. A rolling garment bag can be helpful if you don’t want to have to always carry the bag and its weight in your hand. 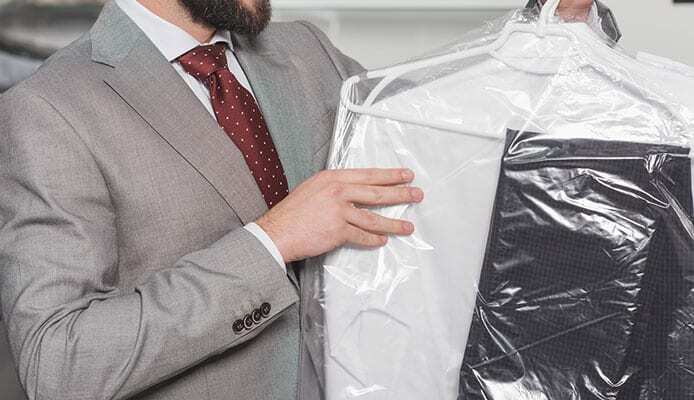 However, if you are wanting to invest in a garment bag for suits, you may prefer a hand carried bag because they can give you the length to essentially carry your hanging suit in a protected case. Other traveling bags for suits are wheeled and they can pack away your clothing with minimal folds and creases. Essentially, the choice between wheeled and carried traveling bags for suits or other clothing, will be up to personal preference. Another choice that will be left largely up to personal preference is whether you want to be able to carry on your garment bag or use the airline’s check-in service to travel with your bag. 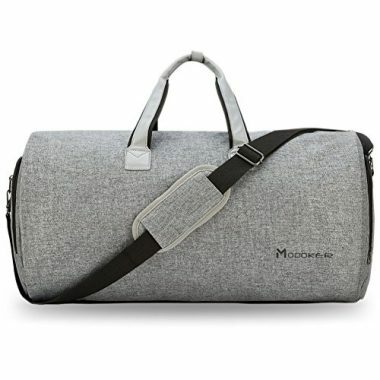 For travelers who need to have their clothing ready quickly once they arrive at their destination, a carry-on suit travel bag is often preferred. A carry-on bag would allow you faster access to your clothing without having to wait at baggage claim. As well, the best travel garment bags can be used for more than clothing and a carry-on bag could also be used to carry your other travel items. However, if you are need a suit bag or men’s garment bag for multiple outfits, you may want a bag that can be checked in, so that you aren’t carrying the weight with you. The best garment bags will be made of lightweight but strong material. Often garment bags are made of nylon, which makes it durable and tough enough to withstand the duress of travel. 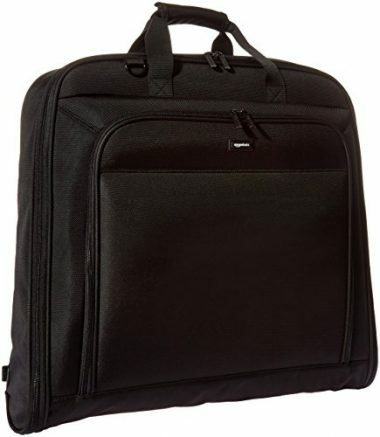 However, if you are wanting to travel in style, there are garment bags available that are made from leather or canvas. Both of which, are also durable materials. If you are a frequent traveler, especially at airports, you know how stressful and tiring it can be. Traveling can wear both you and your garment bags down. After multiple trips through conveyor belts and getting tossed around, only the best travel garment bags that are built with durability will survive. Durability is important for your suit travel bag because it will ensure that it will be long-lasting and can withstand getting thrown around or shoved into overhead bins. A garment bag is an investment and you will want the most durable to last you through all your trips. If you like to stay organized, there are garment bags designed with multiple compartments. All garment bags for suits will have one compartment, but others will have a main compartment with smaller compartments or pockets. Travel garment bags that have multiple compartments can hold more of your gear and keep it separated, so you can create your own organization system. However, it is up to personal preference how many compartments your garment bag has and if it has any at all. You can look at the style of the garment bag before you purchase to see how many compartments it has and if you think it would work for your travel needs. Not all garment bags are waterproof, but some are. This again, will be up to personal preference. If you are traveling to a rainy location or just like to be prepared for it all, a waterproof garment bag can add another layer of protection to your clothes. Even if you think you can fit your bag under travel umbrellas canopies, it might be a nice layer of protection to ensure even accidental drips of rain, don’t damage your clothes. The design of the handle will be dependent on the type of garment bag you choose. Most rolling garment bag designs have an extendable handle, as well as a stationary handle to carry the bag like a briefcase. Carried garment bags will often have one stationary handle that can be used to carry it around. Q: Why do I need a separate garment bag? A: If you’ve ever packed a suitcase, you know your hard it can be to get them organized. You also know that clothing packed into a suitcase is often tucked and rolled into the smallest size possible, so that it can all be crammed together. A garment bag will keep the clothes that you need ironed, wrinkle free, so that they are ready to wear straight out of the bag. A separate garment bag can keep you from being frustrated and save you time from having to re-iron or de-wrinkle your clothing. If you choose a garment bag with multiple compartments, it can even ease the weight in travel backpacks by helping share the weight of your luggage and taking it off your back. Garment bags are also great for all your other outdoor sports gear. Instead of having to cram all your sports equipment into one bag with your other clothing, you can easily carry it separately and organized. Garment bags are great to prepare for a dive holiday, keep your what to wear while snorkeling gear safe, and help care for your wetsuit for surfing. Q: Are garment bags safe for travel? A: Yes. Garment bags are made specifically for travel and to make traveling easier with delicate clothing. A suit travel bag or rolling garment bag should be designed to be safe for you and your clothes. The best travel garment bags will keep your gear protected and make traveling easier on you. Q: Are garment bags water resistant? A: Not all designs are, but a vast majority do have water resistance. Often garment bags do have a small level of water resistance. This means that they can survive a spill or a quick walk in light rain, however they wouldn’t survive a downpour or being submerged in water. If you are looking to go beyond just water resistance, some traveling bags for suits are fully waterproof. We all know that first impressions are important, so if you are traveling for business having clean and wrinkle free clothing is a must. Other times, your clothing allows you to shine for a special occasion and having it in pristine condition is important. With top rated travel garment bags, you are getting your clothing the protection it deserves and your mind the peace it needs. If you know exactly what you are looking for, you can save time and money by investing in the best garment bag for you. Do you own one of the garment bags that made it onto our list? Let us know how it has worked for your travel needs in the comments section below.